From Part 2 of the immensely successful "Assassin's Creed" video game series: presenting our Assassin's Creed 2 Ezio Doublet. It is a licensed product based on the richly detailed virtual original from the game. The gray doublet with a hood and tails is made of high quality, 100 percent cotton damask lined with lightweight cotton in solid red. Wide red vertical stripes trimmed with gray fringe emphasize the doublet's lines from the shoulders to the thighs. The shoulder wings are doubled and slashed to show the red lining. The open collar shows red revers embroidered with arabesques in shiny metallic thread, and the arabesque pattern is repeated in the pattern woven into the matte gray damask background. The doublet fastens at the front with sturdy snap fasteners and three leather straps with metal buckles. The hood is attached to the doublet at the shoulders. It is made of solid gray fabric lined in red, and is cut to look like the head of a bird of prey. 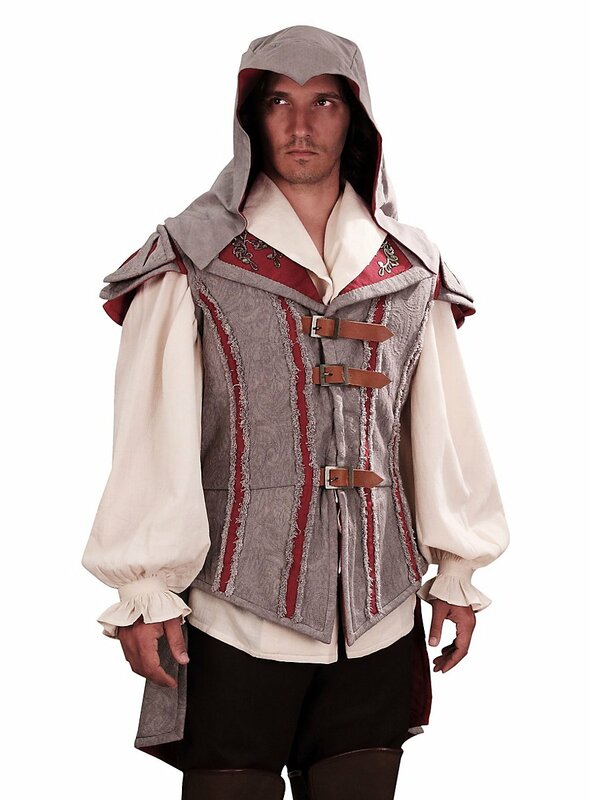 This Assassin's Creed 2 Ezio doublet has tails attached to the waist for even more elegance.